There have been numerous stories in the news recently about vending machines being vandalized and robbed, so much so that it might actually be enough to stop people entering the lucrative vending industry. While the news is always disturbing, you also have to look at where the vandalism is taking place. You rarely hear about a vending machine being trashed when it is located inside a mall or other area that see’s a ton of traffic. Those are without a doubt the most lucrative spots for machine owners, which is why it’s important to think carefully about placement when starting a vending machine business. There are people that will get into the industry by purchasing a refurbished machine online or from private seller in their area. The problem with going that route is that you are then forced to get out there and try and find places to put the machine. Depending on how much you paid for the machine, you may settle for a place that you know isn’t the best choice, simply because you have to start generating some income to recover your initial investment. This is where you have to ask yourself if the money you might save by buying from a private seller is worth the hassle of searching out your own location. 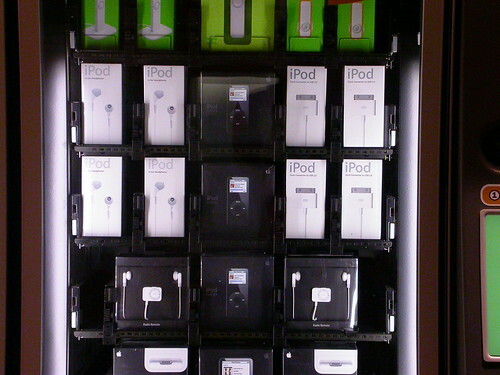 iPod vending machine © by D.L. Where you choose to place your vending machine might also very well depend on what the contents of said machine are. A simple little gumball or coke vending machine might go unscathed in a dodgy location, but a machine that holds high end electronic products isn’t likely to last very long in that same spot. Choosing the perfect place to put your machine involves a little bit of thought, which is why you are better purchasing your machine from a professional distributor, such as yours truly. We have been in the vending machine business since 1968, so it somewhat goes without saying that we know a thing or two about, not only the machines, but where they should be placed. There are certain types of machines that do better in certain locations than others. For example, an iPod machine is not likely to go over that well if placed inside a dollar store, just as a sugary snack machine may not be suitable for a fitness club. Some of it is just common sense, but it’s easy to have that go out the window when you are excited about starting up your own business. Another reason to consider buying from a distributor is because you will then have access to any new parts, flavor tags, or other miscellaneous items that are essential to keep your vending business running smoothly. Taking the time to purchase from a trusted source and really thinking about where your machine should be located will prevent your machine from becoming a notch on the vending vandals bed post.